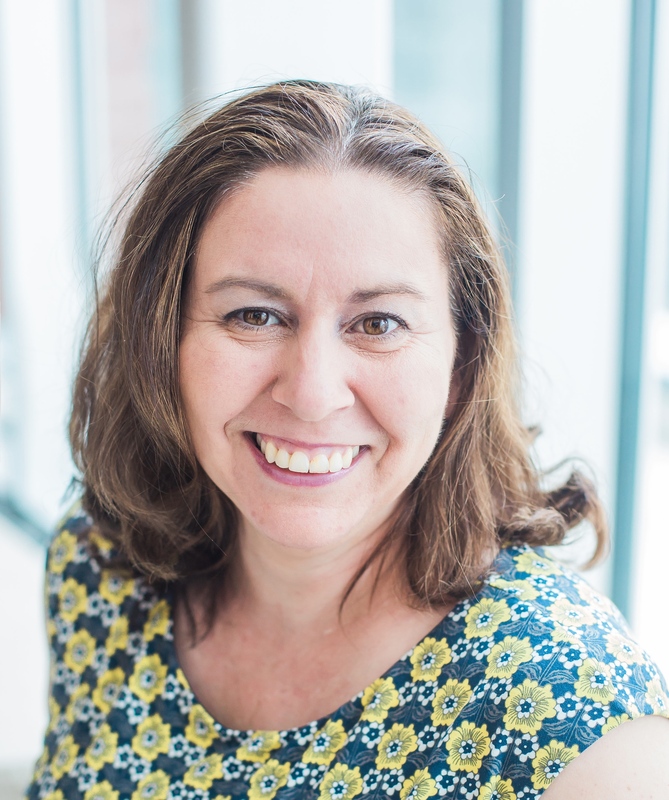 Two ideas came together with this project…. I was on vacation recently at the outer banks and saw a craft shopping that was weaving hand goods out of men’s ties – What a clever idea!! 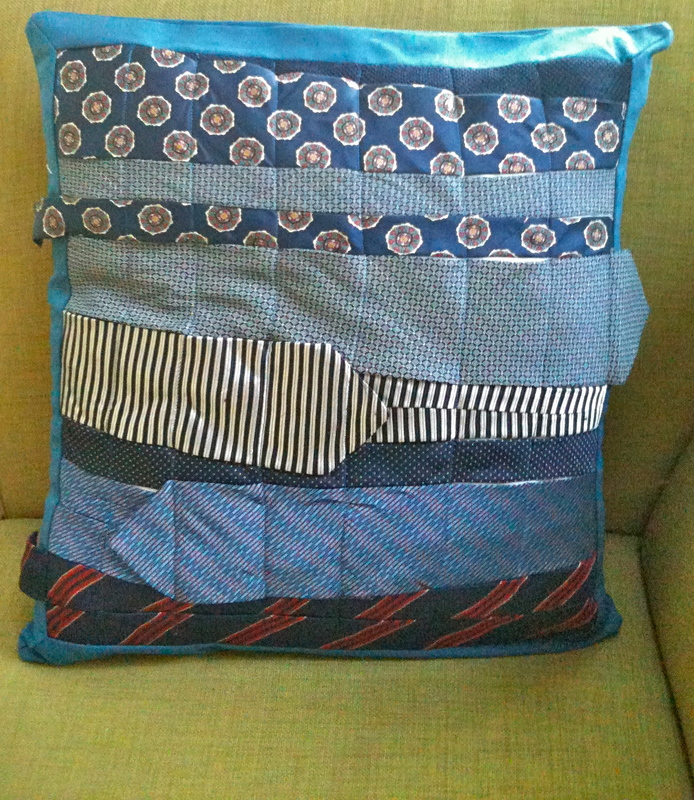 …led me to this idea…what if you could recycle men’s ties and make sofa cushions. I first had to find men’s ties (not an item my surfie-type husband has in the closet 🙂 ) – so I took myself to the Good Will shops around our area. To my surprise ties only cost $1.39 and many of the shops had a good range especially in blue and red. NOTE: you really can’t be too fussy on the color. I wanted oranges, greys and greens at first – was not going to happen. I chose to do two cushions 20×20 using the same pattern I had used for the tea towel cushions, one red and one blue. 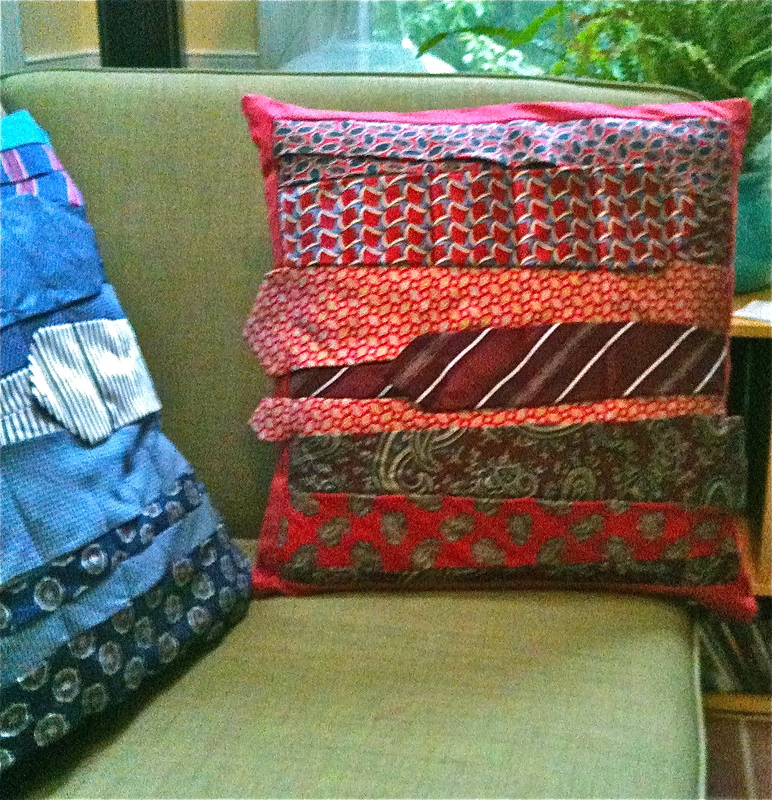 I selected 5-6 ties for each cushion that offered enough variety. I laid then out on a piece of backing fabric (in this case I used white linen I had lying around) and pinned them in place.NOTE: I specifically did not want to lose the structure of the tie so I had some tie ends start in the middle and others will land up sticking loosely over the border.NOTE: Here’s an example in Better Homes and gardens, where they use the ties just as fabric, which also turns out nice in this picture. After the ties are pinned in place, I use scotch tape as a guide I used to sew perpendicular lines to the ties, fastening the ties to the backing fabric. Take your time, lift the foot of your sewing machine when you get to the edges of the tie, one to ensure you catch the beginning of the tie and second to make sure the tie lays flat and not pucker. I then sewed the borders onto this main square, added mitered corners. To get the flap, ends of the tie, to go over the borders, just pinned them out-of-the-way while sewing on the border, making sure I did not catch them in my 1/4 inch seam. 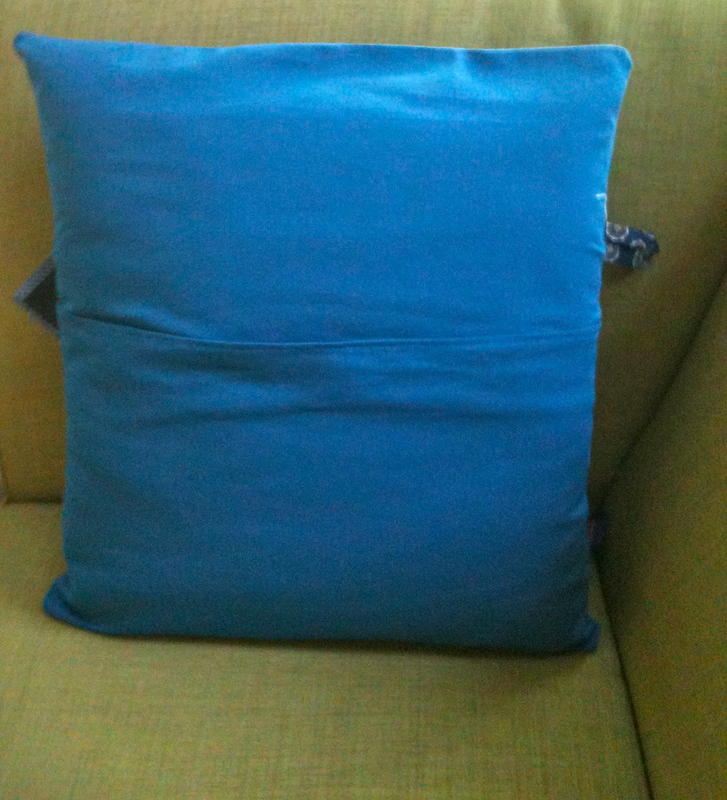 Last step is to sew on the two pieces of the back of the cushion, providing that envelope like cushion. NOTE: The one thing I would try next time is to sew along the edges of the ties first then pin them to the backing. I am not sure if this would make things easy or not though. 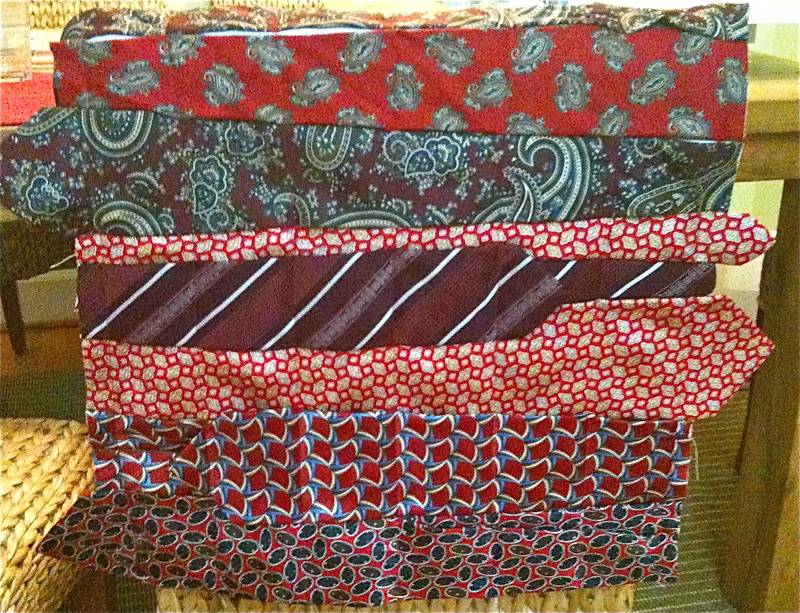 For more ideas on what you can do with ties check out this blog on Sewing with ties, which was this cool site I found after I completed these. In this site, I especially like the tie circles and the tie covered tree art. 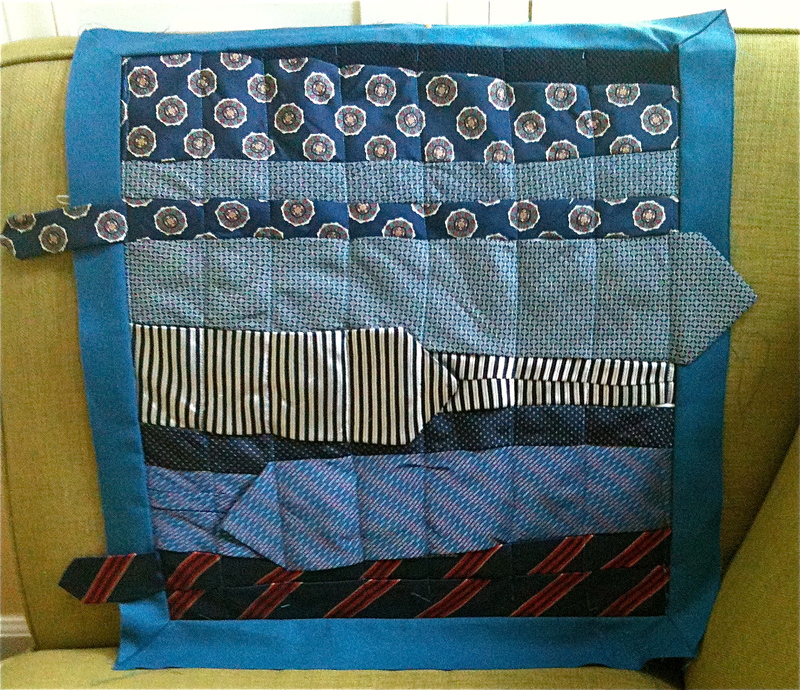 This entry was posted in Uncategorized and tagged crafts, men's neck ties, recycling clothes, sewing ideas, sofa cushions on September 8, 2012 by mlwilkie. Loving your cushions……I understand perfectly why everyone stops by for a visit on your couch….those gorgeous cushions of yours are a magnet.